Environmental and Wardrobe Protection Agency. Highland Cleaners uses the same environmentally-friendly methods to get your clothes clean as we did when we first opened for business 66 years ago. While other cleaners have resorted to using human carcinogens and groundwater pollutants in their dry cleaning processes, we’ve led the industry in the use of traditional wet cleaning and natural solvents. In fact, our solvent is recommended by both Greenpeace and the EPA as the safest cleaning solvent for the environment. We are also working with our suppliers to ensure all of our packaging is recyclable and contains post-consumer content. We have a company-wide recycling effort. We are converting 100% of our store and factory lighting to high efficiency fixtures and using programmable thermostats in all of our buildings. And we are always searching for new ways to adopt green measures wherever we can. So feel good about bringing your clothes to Highland Cleaners. We’re the best in town—and green, too. We use our best judgment to decide whether your clothes are wet cleaned or dry cleaned based on what’s best for the garment. Beyond Highland Cleaners’ already eco-friendly cleaning methods, our GreenWrap client orders are not packaged in plastic. To keep clothes protected from the elements, we offer a Green Service Garment Bag for only $5 (no mark up!). It offers an eco-friendly alternative to single-use plastic dry cleaning bags, while also doubling as a 100% recyclable hanging hamper, carrying bag and duffel bag. For our clients who opt for the GreenClean, we offer the greenest cleaning experience available—no other cleaning process is more eco-friendly! We will wet clean your clothes only, using absolutely no solvents. * This method is considered the safest for the environment. All items of clothing will be cleaned and pressed by professionals for maximum results. If the process is not compatible with your garment—for instance, 100% wool items—it will be dry cleaned and identified as such. Optional Green Garmento bag (as described above) offers an eco-friendly alternative to single-use plastic bags. Get Your Green Garmento Bag Today! 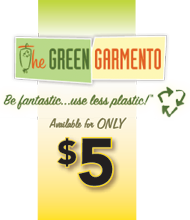 To keep your clothes protected from the elements, we offer a Green Service Garment Bag for only $5 (no mark up!). It offers an eco-friendly alternative to single-use plastic dry cleaning bags, while also doubling as a 100% recyclable hanging hamper, carrying bag and duffel bag. Ready to make life a little Greener? Ask at the Counter and we’ll make sure you get your Green Garmento Bag! For more on Highland Cleaners commitment to green dry cleaning, read owner Anne Jones Nash’s article Confessions of a Dry Cleaner CLICK HERE.